This exhibit traces the history of the Perth Regiment from its inception in 1866 to present day. The theme s of duty, sacrifice, valour, brotherhood, and remembrance are used to highlight the development of the Regiment from its earliest days as a volunteer militia company fighting in the Fenian Raids, through to its role in the liberation of the Netherlands at the end of World War II. This exhibit showcases objects, letters, photos, and personal stories from throughout the regiment’s history. Why “Perth UP”? The Maple Leaf “UP” was an ubiquitous marker during the Second World War pointing the way to Canadian front lines. 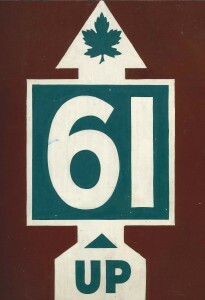 “61” represented the Perth Regiment. How would you describe Anne Frank? Throughout the summer, we have been collecting visitor responses to this question. Here are the top answers, with larger size representing more frequent responses.